Picture this for a moment. It’s 5:30 p.m., and you still haven’t been able to confirm your 6:00 p.m. client, Mary. She’s been with you a couple of months now and hasn’t missed a session to date, so you’re not too worried. Still, she hasn’t texted you back, which is a little concerning. The wall clock hits 6:01 p.m., and you see her through the gym mirrors. She is slamming her car door and sprinting up the front doors looking like a hot mess. In fact, she dropped her water bottle three times in the parking lot. You can tell she’s stressed, but a sense of relief comes over you because she still showed up, regardless of it being late. The workout you wrote for her will decidedly be scrapped, but you’d rather figure something out on the fly than waste time twiddling your thumbs till your next session. Waste a session? Doesn’t Mary know that this is when she needs a session most? This is the perfect opportunity for her to take the time to de-stress, recover and stay on track with all her goals. When a client cancels or reschedules, the likelihood that they'll cancel or reschedules again drastically goes up. Experience shows that when clients don't train, they cancel. Implementing and placing value on recovery sessions completely changes that narrative. Instead of your client cancelling, they come in and leave feeling recharged, energetic, less stressed and very thankful for their trainer. I've personally had many occasions when long time clients say that the recovery session we applied when they were at a low point and wanted to cancel was the best session they’ve ever had. How your client feels after a session matters more to your retention than what you actually do in the session. People don’t remember squats or lunges. They remember how it made them feel. Personal training is a highly emotional business. Emotion is not just part of the sales process, it’s an intricate part of the training experience. If your clients leave feeling great after a session - whether that means feeling challenged, accomplished or energized - they’ll stay with you forever. Let’s dive into what recovery sessions are and what they should accomplish. You’ll see how you can implement them and, critically, how to get your clients to show up for them. The body doesn’t differentiate between stress. Whether it be mental or physical, the body just detects that there’s stress. It’s normal to deal with extra stress. The thing about stress is that it’s compounding. You’re physically stressed, so you become mentally stressed. You’re emotionally stressed, so you get physiologically stressed. Eventually, that culminates into burnout and situations like Mary cancelling her session. Your job as a trainer is to identify the stressors in your client’s lives and help reduce them - ideally before they become overwhelming. 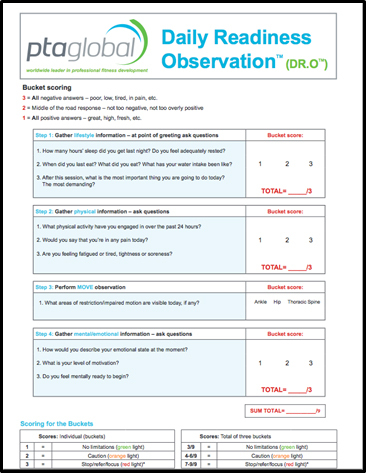 The PTA Global “Daily Readiness Observation” (Dr. O) tool from the Exercise and Stress Management Course is a tool that makes stress easier to manage on a day-to-day basis. This proves very beneficial for clients, resulting in overall stress reduction. The Dr. O uses a set of questions and movement assessments to identify where your client’s buckets of stress are full, and strategies to empty those respective buckets. It’s imperative to attack stress from a physiological and psychological perspective. Physiologically, we need to shut down the sympathetic (“Fight or Flight”) nervous system and activate the parasympathetic nervous system, which relaxes the client and allows the body to recover. We also want to engage in very low intensity movement to further stimulate recovery, release endorphins and get the client moving to tackle whatever the day has in store for them. From a psychological perspective, they need to be focused on the present moment and being successful, which comes down to your coaching and "exercise" selection. The exercise we consistently do throughout the day is breathing. How you breathe directly impacts the nervous system. Your highly stressed client is coming to you with a sympathetic nervous system in full pandemonium. Their body has been pumping adrenaline and dumping cortisol for hours, maybe even days. If you pay attention to their breathing, you’ll notice it’s different - shallow and fast. They need to get into a parasympathetic nervous system state for anything you do to matter. For example, someone wanting to get the benefits of a massage while contracting their entire body is not going to receive the desired results. The massage isn’t going to do anything for them until they can relax. Breathing will shift their entire state. The breath should go from shallow and frantic to deep and controlled. Deep belly breathing by contracting the diaphragm initiates the shift. The diaphragm, which is connected to the vagus nerve, sends an impulse to the brain initiating a shift towards the parasympathetic system. Have your clients lie on their back with their feet flat, the same position as a hip bridge, with the low back barely touching the ground. As they inhale, the belly rises first, with only the last ⅓ of the breath rising the chest. The exhale reverses through the chest to the belly. The inhale and exhale should each take 3-5 seconds. Two minutes of this breathing will typically be enough for them to relax. Once you see the breath become smooth without any twitches, you’re good to move on. Self-myofascial release (SMR) relaxes overactive tissues and helps restore posture. This allows your client to function at a higher level, breathe better and relax. It’s also an easy way to break into movement for the day. Since this is a recovery session, the foam rolling needs to be slow and intentional combined with deep breathing. Sadistic, painful foam rolling has been glorified at times, but that’s the opposite of what you want. Foam rolling needs to be as relaxing as possible. There should be no sensation of pain, because that will trigger the sympathetic nervous system. It’s not the time to break out your medieval soft tissue kit. Instead, go grab that soft foam roller you graduated from years ago. Passes should be slow, moving no more than 1-2 inches per second. Ideally, roll distal to proximal, or towards your heart. That will help push blood back into circulation, so fresh oxygenated blood flows throughout the body to speed up recovery. Deep diaphragmatic breathing is critical to keep your client relaxed during this time. Since you’ll be doing less resistance training or intense exercise, you’ll have more time for SMR. Typically, a full body roll is ideal here, but at least focusing on typical problem areas (calves, quads, t-spine, lats, chest) for clients will do as well. Now that your client is relaxed, the next step is to get them up and moving. If the client is really physically worn out, start with static stretching to ease them into it. If they’re ready to turn the engine on, then break into mobilizers that get the whole body moving. If you’re using the Dr. O, then you’ll have already assessed areas that need focus and have specific mobilizers to address these issues. Mobilizers are basically dynamic stretches that go through a pattern of movement rather than holding one position. Ideally, your mobilizers engage the whole body and move through multiple planes of motion like the video below. Up to this point, the goal has been to keep the client relaxed and moving with intention. The movements in all the previous techniques require focus, so your client should be present in the moment and not thinking about everything else going on in life. The next technique really pushes that envelope while adding in movement. Low intensity movement won’t add stress to your client, but rather help with recovery. Sticking them on a piece of cardio equipment or under a heavy barbell is not what we’re talking about. These moves need to come from games, body weight flows, circuits, easy obstacle courses or your client’s favorite exercises. The intensity should stay low, so the client remains in an aerobic state. For most people, this means keeping the intensity at 65% of their max heart rate. The point of this movement is to give them a jumpstart to keep on moving throughout their day. You can also follow a more traditional workout to get this done. It’s imperative, however, that the volume, intensity and complexity of the workout is tapered down so the client can easily accomplish it. Generally, I prefer to change the workout from the typical program so egos don’t get involved while the clients compare the amounts of weight being used during the recovery session to their typical workouts. The Dr. O also provides plenty of additional suggestions on how to manipulate the sessions to tailor what fits best for your client on these days, as well. It doesn’t matter how great you are as a trainer if you have no clients to train. Likewise, it matters little how well you can program a recovery session or how great your client feels after this session if they never come in for it. You can have the greatest recovery session planned for your client, but it’s important to remember that half the challenge is getting them to stop what they're doing to show up for it. Part of this involves selling your client on it when they're in their moment of desperation. The primary part is building value in recovery sessions before that time comes. Your client needs to feel the value in these techniques and how it benefits them before they need the recovery session. Start by using some of these techniques in regular sessions prior to the need for an entire recovery session. Clients are virtually always stressed, and the program you’ve laid out usually doesn’t happen exactly as planned. Take advantage of this and start using some of these techniques when your client is not 100%, but still functional. After a while, they’ll start to feel the difference in their energy levels, performance and stress from spending time on these techniques. Make a point of asking them how they feel after the techniques so the value is verbalized and explicit. Then when the time comes, it’s much easier to convince them of the necessity to make it in for their session. Depending on how your client contacts you, the first step is being “human” with them. Empathy is a powerful tool. The last thing your client wants is a lecture on what they should have done to not reach this point. Instead, when you connect with them, ask them how they’re feeling and why they think those feelings are present. Allow them to vent. That builds more trust between you and your clients and shows them you have their best intentions in mind. They need to know that it’s not about you not wanting an empty slot in the schedule. This also equips you with the info you need to get them to come in. The more personal you are, the better. Once you understand where they’re at, show them how you’re the solution. Relay whatever benefits are most important to them, whether it’s feeling energized, unplugging, or feeling relaxed. Use probable language with them rather than speaking like it’s only possible that they will come in for a session. For example, rather than saying “If you come in for your session…”, state “When you come in for your session…”. It instills that coming to the session is what they’re doing and that cancelling isn’t an option. During this dialogue, you want to tie in a previous session where they felt stressed and how you handled it together. Once you’ve done your job in previous sessions, demonstrating that value and getting them to come in becomes a reminder of how much better they’ll feel afterward. Remember that training is emotional. Talking about the science of recovery or stress reduction won’t go far. Instead, focus on the emotion and how great they’ll feel after the session. Once they re-commit, your job is easy. Simply plug in the four recovery techniques, and your client will never forget the recovery session. They’ll be on the accelerated path to reaching their goals, and your schedule will stay full. Raphael Konforti graduated from the University of Florida with a Masters of Exercise Science, Go Gators! Holding his PTAGlobal CPT since 2009, Raphael has worked in variety of fitness education roles around the world. He is currently the Fitness Education Coordinator for Youfit in Florida. He prides himself on making the complicated, confusing fitness industry easy to understand. Doing that while slipping in a good joke is his passion. He loves surfing, diving, strongman competitions and yoga, yup pretty random mix.